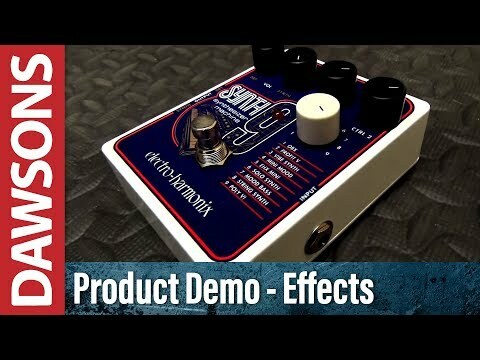 The Electro Harmonix Synth9 Synthesizer Machine Guitar Effects Pedal allows guitarists and bassists to seamlessly emulate vintage synth sounds with their instrument, simply by accessing one of 9 presets and hitting a footswitch. Whether you're looking to create spacey soundscapes, epic leads, or undeniably funky grooves, you'll have no end of fun exploring the tonal possibilities offered by this incredible pedal from the team at EHX. As noted, the Synth9 is very simple to use, with an instrument input and two outputs: Synth and Dry. Across the top panel, you'll find a selection of controls including: DRY, SYNTH, CTRL 1, CTRL 2, PRESET, and the footswitch. The DRY pot controls the volume of the non-effected instrument signal, whilst the SYNTH pot controls the level of the effect-influenced signal at the SYNTH OUTPUT jack. However, in MINI MOOD mode, the SYNTH pot controls the volume of the non-portamento synth, whilst the CTRL 1 pot controls the volume of the portamento synth. The combination of having level control for the individual outputs ensures increased precision over your tone control. The CTRL 1 and CTRL 2 pots allow you to control different settings based on the selected preset synth. The PRESET knob allows you to switch between the 9-available synth presets, which are: OBX, PROFIT V, VIBE SYNTH, MINI MOOD, EHX MINI, SOLO SYNTH, MOOD BASS, STRING SYNTH and POLY VI. At your disposal, there's an emulation of the awesome Oberheim OB-X, where the CTRL 1 acts as a tone control, whilst CTRL 2 allows you to select between a massive 4 octave range. The PROFIT V takes inspiration from another classic, with sweep time adjustment of the downward filter envelope and selection between 8 intervals of octaves or 5ths for mind-blowing tones. With the other available presets there are nods to some legendary vintage synths, as well as some updated versions and Electro Harmonix's renditions of classic models. A detailed description of each preset is included in our "Specifications" section, as well as a guide to getting the most out of your new Synth9. As with every Electro Harmonix product, the Synth9 Synthesizer Machine is built in New York City, to a very high standard of quality. Each knob feels smooth and responds cleanly, whilst the EHX bypass circuitry prevents your dry signal from becoming coloured by unwanted noise. Latency is non-existent, so you can be sure that what you play is what you hear. If you're a fan of classic groups like ELP, EVH, Kraftwerk, Joy Division, New Order, Peter Gabriel, P-Funk, then you're going to love the Synth9. Not only does it turn your guitar into a vintage synthesizer without the need for MIDI or a special pickup, but it also turns your bass into one of the funkiest instruments on the planet. Each pedal is supplied with an Electro-Harmonix 9.6DC-200BI power supply, so all you need to do is plug in and play! 1. OBX – An emulation of the meaty sounding Oberheim OB-X. CTRL 1 is a tone control. Use CTRL 2 to select between 4 octaves. 2. PROFIT V – The Sequential Circuits Prophet-5 provides inspiration for our versatile PROFIT V preset. CTRL 1 adjusts the sweep time of a downward filter envelope. CTRL 2 selects between 8 intervals of either octaves or 5ths. 3. VIBE SYNTH – A polyphonic synthesizer with decaying harmonic content and vibrato. CTRL 1 sets the power and sweep range of harmonics. CTRL 2 adjusts both vibrato rate and depth simultaneously. As you turn CTRL 2 clockwise the vibrato rate and amount increases. 4. MINI MOOD – A big sounding Moog inspired synthesizer that blends a portamento synth with a non-portamento synth. (Portamento is when notes glide from one to another.) Turn the SYNTH VOL knob to set the volume of the non-portamento synthesizer. Use CTRL 1 to adjust the output volume of the portamento notes. CTRL 2 sets portamento time. This preset works best when you play monophonically, one note at a time, where every note is picked. To play faster licks, try turning down CTRL 1. 5. EHX MINI – An emulation of the classic Electro-Harmonix Mini Synth. CTRL 1 sets filter envelope sweep time and direction. When CTRL 1 is set to a point within its counter-clockwise range, it sets the attack time for the filter sweep; when set clockwise beyond “noon” it controls the decay time of the filter sweep. CTRL 2 selects between 4 octaves. 6. SOLO SYNTH – A fuzz-synth preset where a synth oscillator and a fuzz square wave guitar are combined to create one single extreme synth tone! CTRL 1 is a tone control. CTRL 2 selects between 4 octaves. 7. MOOD BASS – The Mini Moog and Taurus pedals served as inspiration for this preset. MOOD BASS works best when played monophonically. CTRL 1 adjusts the sweep time of a downward filter sweep. CTRL 2 chooses between 3 octaves. 8. STRING SYNTH – Our emulation of an ARP string synth. CTRL 1 is a tone control. CTRL 2 sets filter sweep attack time. 9. POLY VI – Inspired by the Korg Polysix. CTRL 1 is a tone control. CTRL 2 sets modulation depth. 5. The usable tracking range on the SYNTH9 extends up to about the 23rd fret on the high-E of a standard guitar and down to the open A-string on a bass guitar.